The Spanish Grand Prix could be an important turning point in the season as Lewis Hamilton has taken the world championship lead for the first time after winning his fourth race in a row. But there is plenty for his Mercedes team-mate Nico Rosberg to be positive about. Rosberg will take heart from the fact he was hunting Hamilton down - just as he was in Bahrain two races ago. It is one thing getting beaten, but it is quite another getting gubbed, which is not a nice feeling at all. The competition has been close enough for Rosberg to know it is about good track position, which generally comes from qualifying as high up as possible. 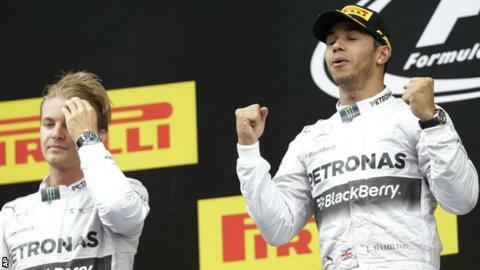 Hamilton's victory in Barcelona was founded on the fact that he beat his team-mate to pole again and converted that into a lead at the first corner. That last little bit of speed is one thing that separates the great racing drivers from the very good ones. And Rosberg has to work on that. He can also take confidence from the fact that, despite having track position, Hamilton was clearly in a spot of bother through the race. It was interesting to hear Mercedes executive director (technical) Paddy Lowe talk to the BBC's Allan McNish after the race about Mercedes' decision to go for two different strategies. The aim is to give the driver behind a second chance to beat the one in front later in the race, by giving him the faster tyre for the final stint. It is an interesting approach for a team to take, because it puts the driver in front under pressure. It is very different from the way a team with a number one and a number two driver would do it, which would be to keep them on the same strategy and ensure the driver behind always stopped a couple of laps later. In the end, Hamilton hung in there. Knowing what it is like to be under pressure towards the end of the race, I was particularly nervous, which makes it exciting for me. I hope the viewing public get a sense of the same excitement from these close battles between the Mercedes drivers, but I am not sure they do. Hamilton was very open afterwards about where his head is at. Of course, he is pleased to have won the races, but he is concerned about the fact that Rosberg has been potentially faster and he wants to understand why he has struggled with the rear of the car and what he and the team can do to help that. One major advantage Hamilton has is that he seems to be using less fuel than his team-mate. That gives him flexibility. Hamilton could choose to start the race with slightly less fuel, making the car lighter by a couple of kilos, which has a quantifiable gain over a race distance. Or he can use that extra fuel to help him out in the braking phase. If you have a locking rear, you can use some extra fuelling on corner entry to stop the brake-by-wire and energy recovery systems under-rotating the rear axle. That has a knock-on effect in reducing the amount of energy the car can harness in that phase, so it is not quite as simple as just using the fuel that you are not burning to your advantage. But it still means Hamilton has room to play with the car - and the way he approaches the race - that Rosberg does not. I was impressed to hear him sharing his thoughts with us in that way - that he is happy, but he has a couple of weeks now to understand where he can improve for Monaco. And it was interesting to see him in the post-race interview with us on BBC One. Halfway through, he took his sunglasses off. Not because anyone had said anything, but because he was enjoying himself, we were all praising him, and he had remembered that polite boys remove their sunglasses in interviews. At times, when things are not going well, Hamilton never gives that a second thought; the projection is all, "Please stop asking me questions". Hamilton will not want to be behind on pace at Monaco, as it is one of those tracks where being quick is a sort of badge of honour for a racing driver. You want to be quick compared to your team-mate at all the classic tracks - Monaco, Silverstone, Suzuka, Spa. Monaco is a circuit where the driver has to feel confident and the car has to give him that confidence. I like how hungry Hamilton was in his words. In his own very gentle way, he is in that mode of, "I've won four, but that's not my season. My goal is not just to beat Nico, it's to crush him". Although he would never say that himself. He knows Monaco is a track at which Rosberg goes well; he won there last year. If Hamilton can come out on top there, what is that going to do to his team-mate? World champion Sebastian Vettel had a strong race in Spain and he will have enjoyed getting stuck in to the wheel-to-wheel racing he needed to do in his climb from 15th on the grid to finish fourth. Those are positives in the context of what has been a difficult season so far. And it was only the second time this year, after his third place in Malaysia, that it looked like Vettel could maintain an attacking pace. Whether that means he has found the answers to the difficulties that saw him out-paced by Red Bull team-mate Daniel Ricciardo in the previous two races in Bahrain and China remains to be seen. It is impossible to make a direct comparison of their pace in Spain because reliability problems mean Vettel had such a truncated weekend in the run up to the race and was on a different strategy to Ricciardo throughout. Furthermore, each was stuck in traffic at crucial times. Vettel's struggles this season have surprised people, because a four-time world champion should be able to deal with a few bumps in the road, or a car not quite to his liking. Equally, in an elite sport where it is all about that last little bit of performance, I am not sure he has had the chance to get there, because he has been pushing cars along the track or sitting in the garage a lot of the time. Vettel and Ferrari's Kimi Raikkonen are the two drivers who have, by their standards, had average starts to the season. Each has had problems, and each had a better weekend in Spain. So I am prepared to give them both the benefit of the doubt. Raikkonen ended up behind team-mate Fernando Alonso, who did seem to be that bit faster in the race generally, but it was looking for a while as if the Finn had the measure of him. The strategy calls that ended up with Alonso ahead after passing his team-mate late in the race, and which Raikkonen questioned on his slowing down lap, were a good baptism of fire for new Ferrari team boss Marco Mattiacci. It will have helped him understand the sort of decisions teams have to make - do we let these guys hold each other up, or do we make a call? As for Vettel, he might be frowning a bit more in public but, seeing him alone as I do from time to time behind the scenes at a race weekend, he seems the same guy to me as he was when he was winning. These guys are high-achievers under a constant spotlight and we notice every wrinkle on their face, every change of expression. It is too early to judge Vettel's season, just as it is way too early to call the battle between Hamilton and Rosberg for the title.